Do something different for Cinco de Mayo: Make your own corn tortillas. Yet the majority of us have never have seen handmade tortillas. Most Mexican restaurants and retailers have machine-made tortillas, pressed very flat with added preservatives to extend their shelf life. Tortillas are a flatbread (see the different types of bread). In a tortilleria (tortilla bakery) or Mexican restaurant, masa (cornmeal dough) is rolled into small balls of dough, flattened and cooked them quickly on a hot skillet. They require only one ingredient—masa harina, a special cornmeal—plus water. Like fresh-baked loaves of bread, fresh-baked tortillas are heavenly—and much faster to make. They have no fat or preservatives, so must be eaten the day they’re made (or stored in the fridge for 2-3 days). 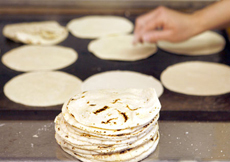 If you don’t have a local tortilleria, it’s easy to make your own. Before wild yeast was harnessed by man, bread meant flatbread the world over: arepa, bánh, bannock, focaccia, injera, johnnycake, lavash, matzoh, naan, piadina, pita, pizza, puri, roti, tortilla and dozens of others. Tortillerias are native to Mexico and Central America, where they remain a staple food. The oldest tortillas discovered by archaeologists date back to around 10,000 B.C.E., made of maize (maize—corn—is native to Central America). The dried corn kernels were ground into cornmeal, which was mixed with water to make a dough called masa. When Hernán Cortés and his conquistadors arrived in what is today Mexico (on April 22, 1519), they encountered the native women making tortillas—flat corn bread. In the Aztec language Nahuatl, it was called tlaxcalli (teu-ax-CAH-lee). The Spanish called them tortillas, little cakes. Originally hand-flattened, “technology” most likely evolved to flattening with an implement, and later to manually operated wooden tortilla presses, flattening the tortilla dough one by one. Modern machinery can produce up to 60,000 tortillas an hour. Tortillas are now wheat flour in addition to maize. Typically, corn tortillas are used for tacos, flour tortillas for burritos. 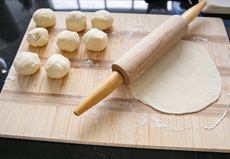 Top: The dough is rolled into small balls, eachh of which becomes a tortilla (photo courtesy LoveAndOliveOil.com). Center: The balls are flattened and placed on the grill (photo © Jim Damaske | Tampa Bay Times). Bottom: Beautiful, fresh tortillas (photo TheGumDropButton.com). 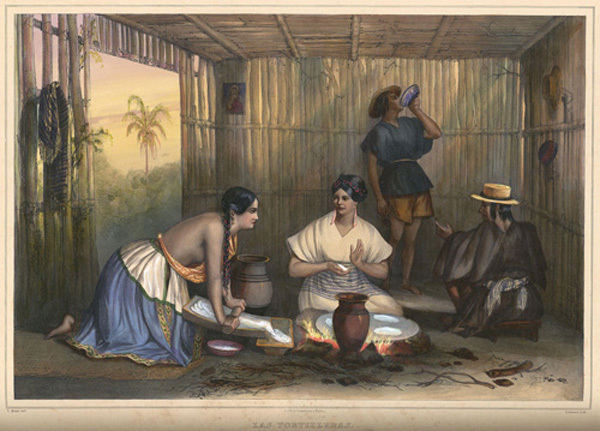 Mexican women making grits in a work by Carl Nebel, 1836. Unless you work with these products regularly, you can’t be expected to know that all arground cornmeal, dried corn that’s ground down into smaller, coarse bits. Corn flour is the most finely-ground maize. When nixtimalized, it becomes masa harina, used to make tortillas and other flat breads. Compare it in uses to all-purpose wheat flour: for fried food batter (start with a 50:50 mix of wheat and corn flours, for dredging, pancakes, etc.). Cornmeal, also spelled corn meal, is coarse-ground maize (corn). It is used for arepas, grits for breakfast cereal or dinner sides, cornbread, fried foods, gluten-free cakes and pie crusts, hush puppies, Indian Pudding, shrimp and grits, and many other recipes. Cornstarch is a thickener made from refined maize starch. It is a very fine powder. Grits are hulled and coarsely ground grain. Grits can be made from any cereal, although corn grits are the norm. Here are uses for grits for breakfast, lunch and dinner. Hominy grits are the same thing as grits. Grits is the shortened term for hominy grits. 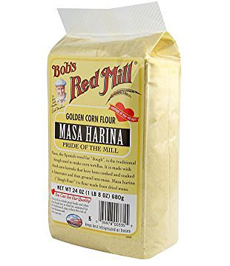 Masa harina, meaning “dough flour for tamales,” is very fine-ground nixtimalized corn used for tortillas and tamales. Masa and hominy are both nixtimalized corn kernels, but hominy is ground from white corn. Polenta is a paste or dough made from medium- or coarse-ground cornmeal. It is cooked, formed into a roll and then fried or baked. Southern grits are made from a different type of corn than polenta. Grits are made from dent corn; polenta from Italy is made from flint corn. Flint corn holds its texture better, which is why grits are the consistency of porridge and polenta is coarser and more toothsome. All you need to make tortillas is masa harina and water. Masa harina, Spanish for dough flour, is the corn flour (corn meal) used to make tortillas and tamales. You can’t substitute regular cornmeal: Masa harina is specially treated corn (see the next section). *If you’re near a tortilleria, you may be able to purchase fresh, smooth-ground corn masa. On the other hand, if you’re at a tortilleria, you can purchase the tortillas freshly baked. Top: All you need to make tortillas: masa harina and water (photo courtesy Bob’s Red Mill). Because the corn flour is the only flavor to the tortilla, buy the best. Bottom: The tortilla recipe is from Rick Bayless’ great book, Everyday Mexican (photo courtesy W.W. Norton, Inc.). 2. SET a large griddle (one that stretches over 2 burners) or 2 skillets on your stovetop. Heat one end of the griddle (or one skillet) to medium, the other end (or other skillet) to medium-high. 3. SQUEEZE the dough gently. If it is stiff (it probably will be), knead in some water, 1 or 2 teaspoons at a time, until the dough feels like soft cookie dough: not stiff, but not sticky. Divide the dough into 15 pieces, rolling each into a ball. Cover with plastic. 4. CUT 2 squares of a plastic bag, 1 inch larger than your tortilla press (we used our George Forman grill with the flat plates). Open the press and lay on one piece of plastic. Lay a dough ball in the center, and gently mash it. Top with the second piece of plastic and close press. Gently flatten the dough into a 1/8-inch-thick disk. Peel off the top piece of plastic. 5. FLIP the tortilla onto your right hand (if you’re right-handed); the top of the tortilla should line up with the side of your index finger. Gently roll it onto the side of the griddle (or skillet) heated to medium. Let the bottom of the tortilla touch the griddle, then lower your hand slightly and move it away from you. The tortilla will stick to the hot surface so you can roll your hand out from under it as it rolls down flat. After 30 seconds, the edges of the tortilla will dry slightly and the tortilla will release from the griddle. Until this moment, the tortilla will be stuck. 6. FLIP the tortilla onto the hotter side of the griddle (or the hotter skillet) with a metal spatula. After 30 seconds, the tortilla should be lightly browned underneath. Flip it over. Cook 30 seconds more—the tortilla should puff in places (or all over—a gentle press with metal spatula or fingers encourages puffing). Transfer to a basket lined with a napkin or towel. 7. PRESS and bake the remaining tortillas. Stack each newly baked tortilla on top of the previously baked tortillas. Keep the tortillas well wrapped in a kitchen towel for warmth. Some people have a tortilla steamer to reheat tortillas in the microwave (we picked up a silicone steamer and use it every day to warm or steam other foods in our microwave). But you don’t need one: You can substitute a kitchen towel. In the microwave: Drizzle 3 tablespoons of water over a clean kitchen towel and wrap the tortillas. Place in a microwaveable plastic bag and fold it over—don’t seal the bag. Microwave at 50% power for 4 minutes to create a steamy environment around tortillas. Let stand for 2 or 3 minutes before serving. In a vegetable steamer: If there is a center post, remove it. Pour 1/2 inch of water in the bottom of a pot. Wrap the tortillas (no more than 12 at a time) in a clean kitchen towel. Place it in the steamer, put the lid on the pot and set it over high heat. When the steam begins to seep out under the lid, time for 1 minute. Then turn off the heat and let the tortillas steam for 10 minutes. On a griddle: Quickly reheat the tortillas one at a time on a dry griddle or skillet. With kitchen tongs: Hold the tortilla with tongs over a low flame. Flour tortillas are made with added fat—lard or vegetable shortening—and salt. A standard six-inch corn tortilla contains about half the fat and calories and one fourth the sodium of a similar-sized flour tortilla. 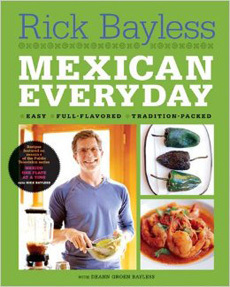 Recipe © copyright 2005 Rick Bayless, Mexican Everyday, W.W. Norton & Company, Inc.